Sprout Chaat Salad + New Site! Hi! I've got a new home. 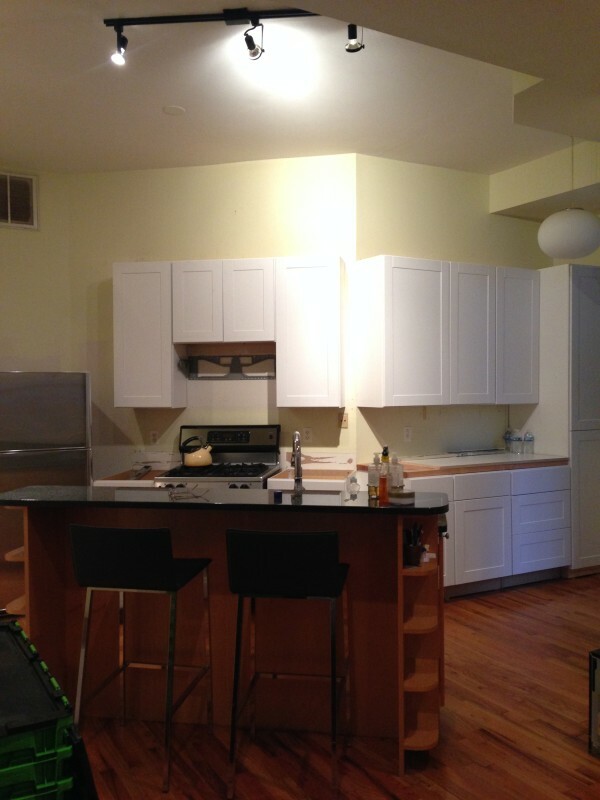 Not Derby Pie is still there - go see for yourself - but it was time for a fresh start. I never really had the technical wherewithal to manage my own website. I faked it pretty well for 8 (!) years, but with every automatic Wordpress update, my site would break a little bit more – the header, gone! the comments, gone! etc – and late last year, I finally decided I needed a full reboot. So, here we are: From now on, I'll be sharing new recipes over here, at rivkafriedman.net. I used Squarespace to build this site, and I hope you love its clean interface as much as I do. The search function is simpler, the design is 100% mobile-friendly, and I've managed to haul all of my old posts over to this new home, with only minor glitches in spacing and captions and whatnot. I'm 90% of the way there. The biggest issue is that ingredient lists in recipes transfer as a block, not a list. You may see some other minor formatting issues for a little while longer. If a recipe looks particularly garbled, you can always find it back on NDP. New year, new start. I'm so excited to finally share this with you. Now then, onto business. 2016's first sprouts are ready for a salad. A few days ago, I sat on our couch in stretchy leggings, nursing a mug of my favorite chai and watching Adi figure out what hands are. She brought them really close to her face and just stared, turning them slowly, trying to figure out whether they were attached to something, or someone, and what they might be there for. And I realized, as I watched her patiently, painstakingly, unrelentingly trying to figure out her limbs, that this first chapter of parenthood might already be behind me. 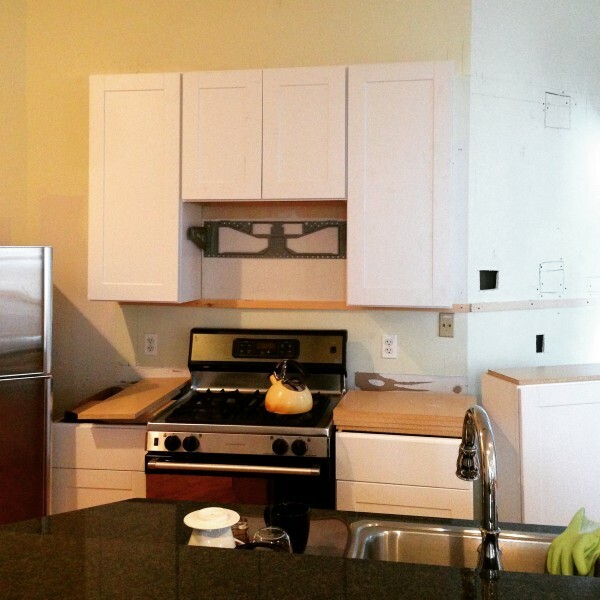 Since the above pics were taken, we got a fresh coat of paint, cabinet hardware, and a few more finishing details in place. 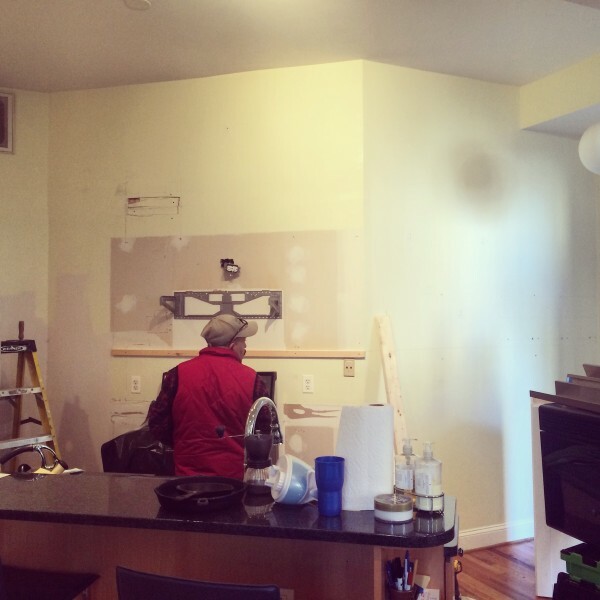 I tell myself that once the granite is installed and the moving boxes are gone, I'll start blogging in earnest again, with the same frequency as before Adi was here. But that's probably not realistic. Life is busier now. There's less time, which means fewer fussy recipes, and fewer pictures. The whole enterprise of eating feels different these days; I'm proud if I manage to bake off a loaf of (no-knead) bread in time for Sunday breakfast. When dinner isn't one of my increasingly-becoming-my-specialty salads, it's a bag of soup or beans from the freezer. As I slowly but surely draw down my stash of frozen meals, I wonder when I'll have a chance to replenish it. So what does this mean? If I had to guess, I'd bet on more posts about fast lunches and dinners, and fewer tales of day-long projects. Hopefully that's good news; everyone is busy, and everyone could use some inspiration when it comes to good, healthy, non-fussy meal options. So here's one to start: plenty of kale, pounded soft. Diced cucumbers. A can of chickpeas. Feta cheese, pomegranate seeds, fresh croutons. That, and a couple clementines, was our dinner last Monday. And even though the weather outside was a biting, blustery, rather unbearable 5 degrees, we managed to eat salad for dinner - and feel full and satisfied and not sad that we didn't eat soup. A small victory, but a victory nonetheless. I start the croutons on the stove, then transfer them to the oven so they don't char too much. I tear up the kale and dice the cucumbers while the croutons toast, so everything is ready at about the same time. As for the pomegranates, I tend to prep two at once, then stow the seeds in a container in the fridge for a la minute use. You can also buy the seeds ready to go at TJs and other grocery stores. If you don't have pomegranate seeds in the house, don't despair. One night last week, I added in some grapefruit segments. Chickpeas became cooked cannellini beans from the freezer, and I added some slivered radish for crunch. The template is a big pile of kale, a simple vinaigrette, and enough croutons that dinner doesn't feel overly virtuous. Everything else is customizable. It's a winner, even in winter, and a staple once the chill starts to thaw. Preheat the oven to 325 degrees F. Put the kale in a large mixing bowl and massage the leaves lightly with your hands, to break up the fibrous texture and soften them. Heat 2 tablespoons of the olive oil in a frying pan (I like cast iron) over medium heat. Add bread cubes and a light sprinkle of salt, and cook 2-3 minutes, until crisped on the bottom side. Turn croutons, then transfer to the oven for 8-10 minutes while you assemble the rest of the salad. In a small bowl, combine remaining 2 tablespoons of olive oil, lemon juice, and vinegar. Add a large pinch of salt and a few grinds of pepper; whisk to combine. Add remaining salad ingredients to the bowl with the kale. Drizzle dressing over salad, and toss to combine. Remove the croutons from the oven (careful – they’re hot!) and add them to the salad. Toss to combine, and serve. During our week on Hilton Head Island, my brother-in-law and I spent an afternoon bouncing around recipe ideas and exchanging high fives over recent cooking successes. I told him about my dosas and a particularly good peach slab pie, he told me about the ethereal cake doughnuts he'd recreated from an old family recipe. 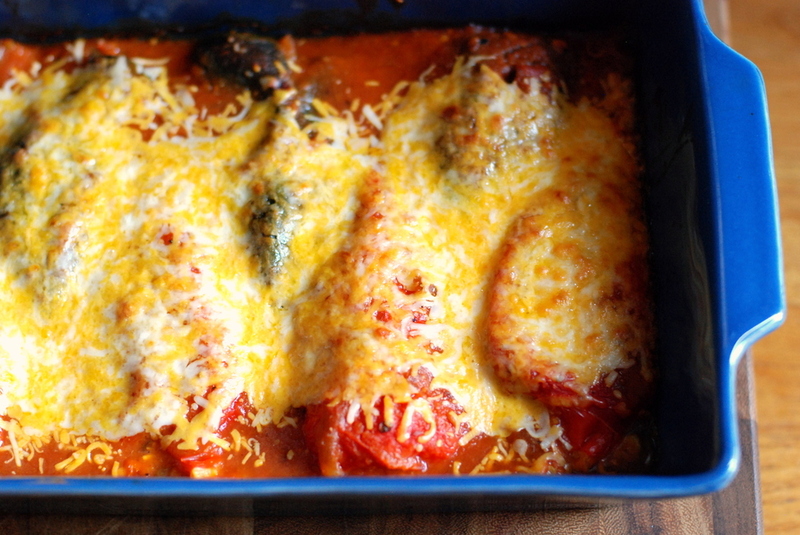 Then he told me about some slam-dunk chiles rellenos he made, and I started to get jealous. Or maybe just really hungry. I wanted those chiles rellenos, stat. Stephen's version sounded pretty authentic. The chiles were deep-fried, and the sauce was a split-egg concoction that had to be timed perfectly. He nailed it and reaped the rewards. But I'm settling into a slightly lower-key mode of cooking, one that involves lots of casseroles and things I can make in advance. I also vaguely remembered an episode of a bobby flay show from back before I swore off the terrible food network, where a California restaurant called La Casita Mexicana made its famous chile relleno in the oven, instead of in the fryer. Between my faint memory and my very not faint appetite, I figured something could be done. 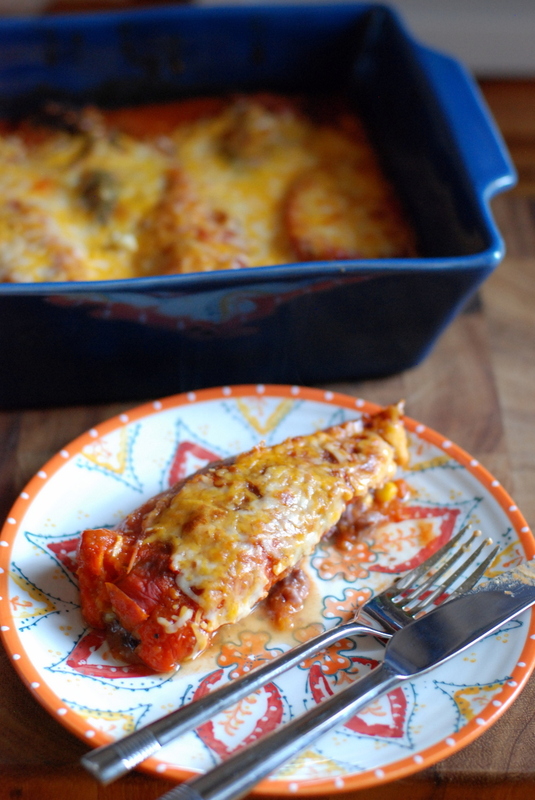 Chiles rellenos casserole recipes abound, but they're almost all egg-based - like a massive frittata enveloping stuffed chiles. I wanted the chiles to stand out more, and - shocker - I wanted the casserole to be saucy. So I riffed on the method for manicotti, basically swapping peppers in for noodles and Mexican stuff for all that ricotta. Here's where the road forks. I loved this dish. Next time, I'd make two pans full and freeze one unbaked - it's the perfect thing to have tucked away in the depths of the freezer for a lazy dinner at home. But D found the whole thing way too spicy, and she ended up taking out the leftover corn filling and making it into a quesadilla. Winners, losers. I think she just got a particularly hot pepper - mine was pretty mild. See below for some thoughts on avoiding the last-minute scramble and/or sad face due to heat. Notes on the fuss: Even though this is a casserole, it isn't the "dump everything in a pan and bake" kind of casserole. It's a bit on the fussy side. If you're feeling hesitant about the fuss, you can skip the tomatillos+tomatoes step and just use a large jar of whatever salsa you like. You can also probably skip blending the beans, and just toss them in with the corn; the result will be different, but no less tasty. Lastly, if you do bother to make the recipe, you might make a double batch. This is the sort of thing that freezes beautifully, and that way, it's twice the food for the effort. Notes on the heat: One last note: poblanos are notoriously inconsistent in spice level. Some are as mild as bell peppers, and others are really quite hot. If you're nervous about the casserole being too spicy, you might consider substituting Anaheim chiles or even banana or bell peppers. Another nice option, though not widely available, are Jimmy Nardellos, which are shaped long and lean, but are not at all spicy. Can I make this vegan? Definitely. Skip the cheese (or replace with soy cheese) and you're good to go. Roast the peppers: Preheat the oven to 425 degrees F. Set the poblanos and tomatillos on a baking sheet lined with foil, and roast until blistered and soft all over, about 30 minutes total, turning peppers once halfway through roasting. Transfer peppers to a heatsafe bowl, cover with a piece of plastic wrap, and let the peppers steam while you prepare the sauce. Lower the oven to 350 degrees. Prepare the sauce: Transfer tomatillos in the jar of a blender or a food processor (I like a miniprep). Add the tomatoes and half the chipotle, and blend until smooth. Taste, and add any salt and, if desired, more chipotle, as needed. Transfer to a bowl and set aside. Prepare the fillings: Drain the beans, and add to the same blender or food processor container along with half the epazote or oregano. Blend until mostly smooth, adding water by the tablespoon if the beans won't blend. When beans are mostly smooth, set aside. Heat the olive oil or butter in a saute pan over medium heat. When hot, add scallions, corn, and remaining epazote or oregano. Cook 5-7 minutes, until some of the corn has turned golden. Transfer to a bowl, add cotija cheese, and stir to combine. Assemble and bake casserole: By now, the peppers should have steamed enough that their skins slip right off. It's okay if little bits of skin remain, but try to remove as much as possible. Slit each pepper lengthwise down one side of the pepper, and scoop out the core and seeds from the pepper. Lay the slit pepper on a cutting board or work surface. Repeat with remaining peppers. Pour 1/2 cup of the sauce into a 9x13" baking pan. 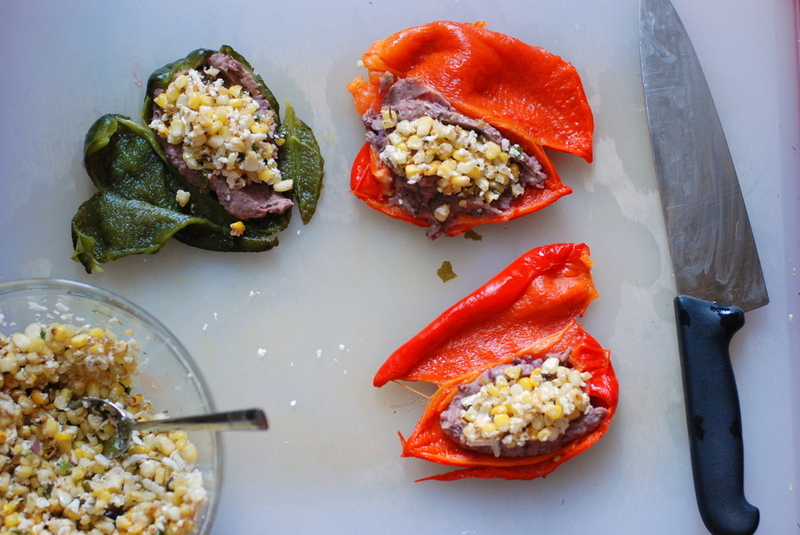 Smear a large spoonful of the bean puree onto the inside of each pepper. Top with a couple spoonfuls of the corn-cotija mixture. Wrap the clean side of the pepper over the filled side, and transfer the filled pepper into the baking pan. Repeat with remaining peppers, laying peppers in the pan in alternating directions. You probably will have some leftover corn mixture; reserve it for stuffing quesadillas, or just eat it as is. Spoon the remaining sauce over the peppers, and top with the grated cheddar or pepper jack cheese. 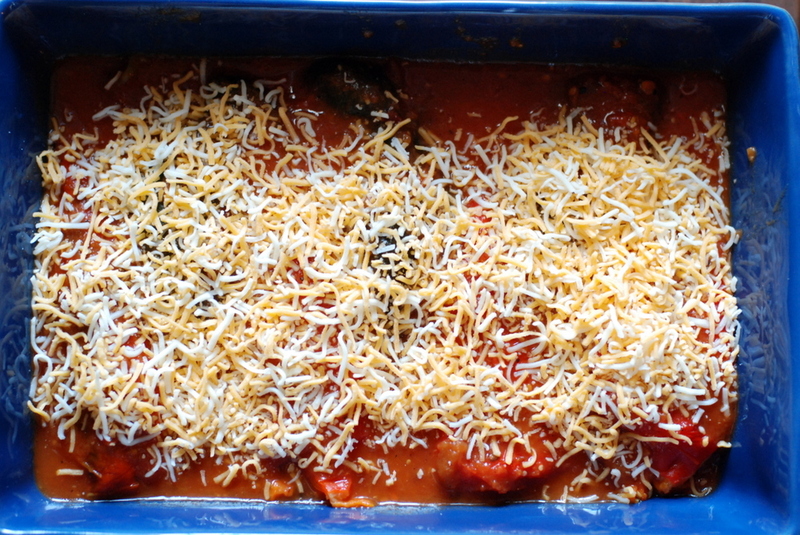 At this point, the casserole can be frozen (preferably without the cheese), to be baked at a later date. Alternatively, transfer to the oven and bake for 25 minutes, until cheese is bubbly and melted. Let cool for 5 minutes before serving. Late summer is a predictable season around here. There are tomatoes on the counter, which we position strategically to keep fruit flies at bay. (I can't say we necessarily succeed - those fruit flies are such a nuisance.) There's a glut of second nectarines and peaches, perfectly ripe and 99 cents a pound from Toigo, which we consume somewhat recklessly and with pride. There are Italian plums, which find their way into this famed torte and this less famous but quite tasty cake. And then, of course, there is all the corn. The corn is also from Toigo. It's the sweetest corn available - so sweet that Beth (wife of Jeremy, he of Andalusian gazpacho and fried squash blossoms) made a corn soup last week and fretted that it was too sweet, that it needed some lime to cut the sweetness. If you're into corn ice cream, you'll want to start with Toigo's corn. 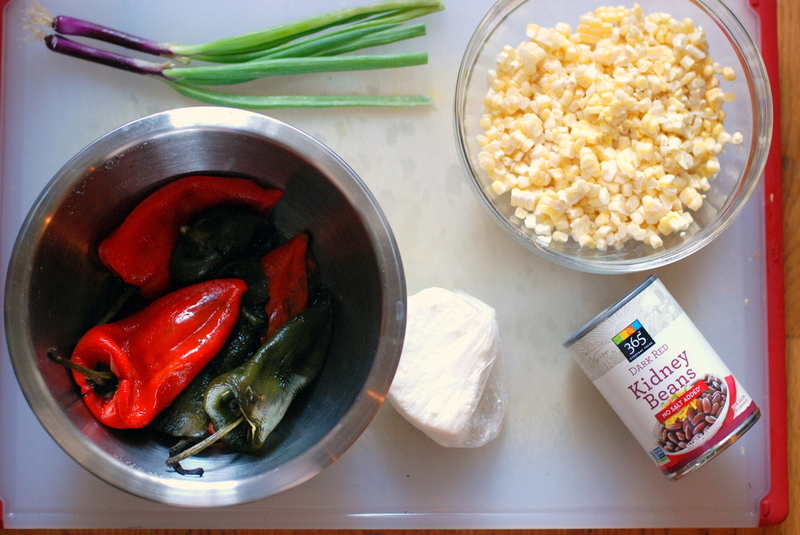 But even if you're making something savory, as I typically do, sweet corn is a good place to start. If you've ever ordered elote, the flavors of this dish will be familiar. Elote is Mexican street corn: a whole cob, coated in crema and chile, then dunked in cotija and finished with a squeeze of lime. It's addictive. But sometimes you want the corn off the cob, ready to fork straight into your mouth. 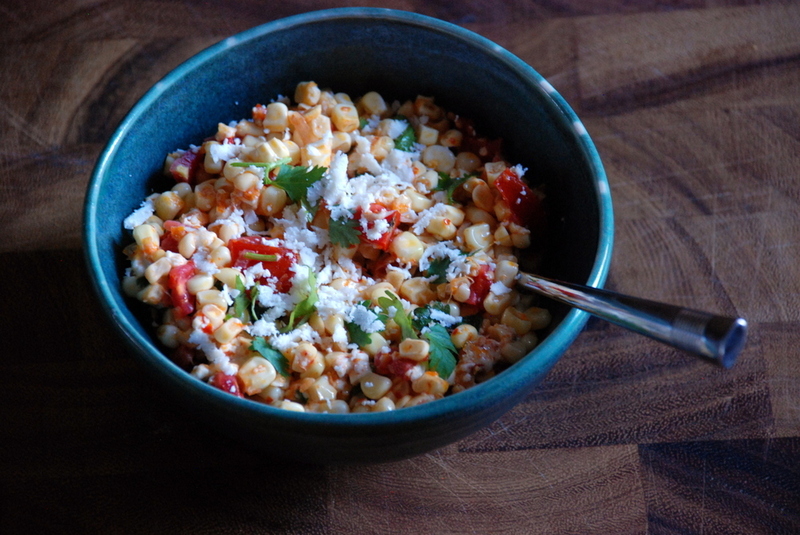 Enter elote salad, a chopped-and-ready version of the messier original. Stateside versions often coat the corn in mayonnaise, which you know I despise. The salad renditions I found online also call for mayo, which makes an otherwise balanced dish look gloppy and gross. Why would you do that? Here's my counter-proposal, cleaner and fresher and more suited to summer: sweet corn, a little butter, chile, cilantro, lime. Lots of cotija to finish. Enough forks for you and all your friends. Sounds pretty good, doesn't it? And while you're bothering with 5 corn cobs at a time, save those stripped cobs. Simmer them in water for 30 minutes, and you have a killer corn stock - a perfect base for chowder and more. Add butter to a large saute pan and set over medium heat. When butter sizzles, add scallions, toss to combine, and cook 5 minutes, until softened. Add corn, chile, and 1 teaspoon of salt. Cook, stirring occasionally, just until very fragrant and starting to soften, 3 minutes or so; you want the corn to retain some bite. This is a warm salad, not mush. Taste corn, and add more chile and/or salt as needed. Then add tomato chunks, reserving the accumulated liquid for another use. Stir to combine, and cook about 3 minutes more, just until tomatoes are warmed through. Add lime juice to taste. Spoon into a deep bowl, top with cilantro and cotija, and serve warm.